Can Revel’s poor design and approach to customers be fixed? Revel in Atlantic City has been bought, and there’s hope that the new owners can reopen the property and turn things around in a major way. But for that to happen, they’ll need to make some major changes to the property. Here’s a list of three big problems and the solutions the new owners, Brookfield, should undertake to fix it. First off, they went too high-end. There are a lot of casual gamblers who felt more confortable at casinos like Trump, Resorts, Bally’s, and others along the boardwalk. 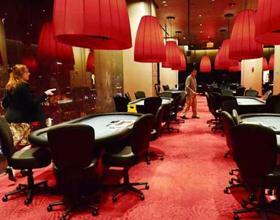 Even Borgata, which feels high-end much like the Bellagio in Vegas, still feels like it welcomes players. That’s true of their attitude. That’s true of their promotions. But Revel wasn’t able to attract the average gamer. They also alienated players even further by making their casino non-smoking. Hey, I don’t smoke. In fact, I absolutely love going to Fallsview Casino up in Canada when I visit my relatives because there’s no smoking inside due to provincial laws. But from a business perspective, when all your competition lets patrons smoke and you don’t – and when most gamblers love to smoke – you’re going to lose business. Solution: Make their property more attractive to the casual gambler. Go mid-level, not high-end, and make sure patrons can smoke. The casino isn’t at ground level. In fact, it’s way up there, accessible only by a really long elevator that doesn’t look very welcoming. What’s more, there’s no casino button in the elevators. You only have access to the hotel lobby. You need to get off the elevator and take another elevator or an escalator to get to the casino. That makes things even more confusing. Solution: Moving an entire casino floor isn’t ideal. But you can move the lobby and reconfigure the entranceway so patrons enter on the casino floor. You could also construct new elevators that lead directly to the casino floor and make them more visible. Yes, Revel sits at the foot of the boardwalk and is within spitting distance of the Atlantic Ocean. And yes, Revel offers some spectacular views from the hotel rooms. But the entrance off of the boardwalk is way too uninviting. Solution: Making the boardwalk entrance more inviting is a smart solution. Perhaps knock down some of the exterior walls and toss in a food court that would make the place seem more casual and welcoming. Give people a reason to explore, not a reason to feel isolated and alienated. There’s no word yet on when Revel will reopen, nor has Brookfield said whether they’ll rename the property. Whatever happens, we’re keeping tabs on the developments, so stay locked to Palace of Chance.